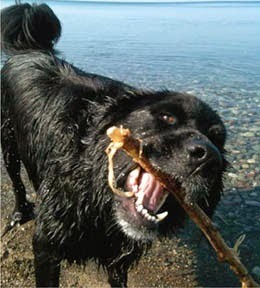 New York Sea Grant is partnering with the Pennsylvania and Lake Champlain Sea Grant programs and New York State Parks to remind dog owners to enjoy the water this summer, but remember to stay smart, safe, and informed about algal blooms and their impact on people and pets. “Harmful algal blooms, also known as HABs, are dense populations of cyanobacteria, also known as blue-green algae. Not all blooms are harmful, but some algal blooms can produce toxins that affect the liver, nervous system, and skin of humans and their pets,” says Jesse Lepak, Ph.D., Great Lakes Fisheries and Ecosystem Health Specialist with New York Sea Grant. Dog deaths suspected as a result of harmful algal blooms prompted New York Sea Grant to develop a Dogs and HABs informational brochure in 2014. The brochure, updated in 2017, is downloadable from http://seagrant.sunysb.edu/articles/r/2748 with video clips. In 2018, the New York State Office of Parks, Recreation and Historic Preservation enters its second year of making the brochure available at information kiosks in parks across the state. Lake Champlain Sea Grant has adapted the brochure for use in Vermont. Partners in the Pennsylvania Lake Erie HAB Task Force intend to use the brochure as part of ongoing outreach in northwest Pennsylvania. A Task Force member, the Regional Science Consortium at the Tom Ridge Environmental Center at Presque Isle, PA, will include the brochure as part of its new Mobile HAB Lab project. Toxic HABs can develop in less than 24 hours, which can be faster than testing for toxins can be completed. In addition to Boyer and Bischoff, those assisting New York Sea Grant with development of the Dogs and HABs brochure included the New York State Department of Environmental Conservation, US Environmental Protection Agency, NOAA National Ocean Service, Stony Brook University School of Marine and Atmospheric Sciences, and Sea Grant Network colleagues. In 2017, the New York State Department of Environmental Conservation listed more than 100 potentially harmful algal blooms in waters across the state. The number of HABs has been increasing such that NY Governor Andrew Cuomo introduced a $65 million initiative to combat HABs. To learn where suspected or confirmed HABs may be in NY waters: see the New York State DEC Harmful Algal Blooms Notification Page. New York Sea Grant is a cooperative program of Cornell University and the State University of New York, and one of 33 university-based programs under the National Sea Grant College Program of the National Oceanic and Atmospheric Administration. New York Sea Grant maintains Great Lakes offices in Buffalo, Newark, and Oswego, NY. For updates on New York Sea Grant activities, www.nyseagrant.org has RSS, Facebook, Twitter and YouTube links. 1 Comment to "Dog Owners: Stay Smart about Algal Blooms in 2018"